An important business lunch. A promising first date. Meeting your significant other’s parents for the first time at a fancy restaurant. There are plenty of times in our lives when we’re nervous about picking out just the right outfit, deciding what to say and what not to say, and when it’s really important to make sure you’re on your game. While we’re not really qualified to give you fashion direction or small-talk advice, all of us at my dental office in Glen Allen can help you quickly fix any awkward dental moment with ease. While bad breath may be hard to avoid after eating a garlic-loaded pasta dish, there are several ways to beat post-dinner bad breath. Some solutions do require a bit of preparation. Before you head out to the meal, stop and grab some sugarless gum. After you eat, pop a piece in your mouth and chew quietly to successfully curb any bad smells from lingering throughout the night. If no gum is available, drink water. Water has cleansing properties that can help remove the bad-smelling agents from your tongue. If your breath is less than fresh all the time, see your dentist in Glen Allen as it could be a sign of something serious. It happens, and while there are several ways to successfully remove the pestering piece, not all of them are appropriate at the dinner table, and some can even end up causing damage to your teeth, gums, or mouth. Play it safe. If something’s stuck in your teeth, swish some water around in your mouth to try to loosen it, or chew a piece of sugarless gum to unstick the culprit. If the food is really wedged in there, it’s best to excuse yourself and head to the restroom. Floss is always the best choice, but if you don’t have it, you can use your fingers or try the corner of a folded paper towel. However, never ever use a tool that could cause damage. Avoid wires, pens, keys, tweezers, and bobby pins. Occasionally, one of your dining partners may be victim of the wedged parsley stuck between the canines. If this occurs, you can help them avoid that crushing moment later, when they’re looking in the mirror, see the piece of food, and wonder how long it was there and why nobody mentioned it. Be a hero. Nonchalantly point to your own mouth which will instinctively tell your pal that something is stuck in his or her grin. No matter what the occasion, a little stop for sugarless gum, a habit of carrying floss, and a plan can go a long way toward avoiding what would be an awkward dental moment. 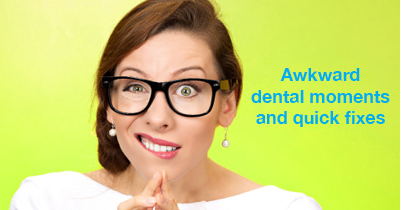 With the right tools and tips, you’ll be an expert at easing the worry of dental faux pas. Serving patients in Glen Allen, Richmond, Short Pump, and surrounding communities. Posted December 17, 2014 by Glenn Fortner & filed under General Dentistry.